This is the last part of my 5-part travel series on Ubud where I share things to note as a traveler living in Ubud and how to make the best out of your trip here. In this post, I share the miscellaneous parts about Ubud, including insects, language, internet speed, and more. 🙂 Finally, I conclude and share my final views about Ubud as of 2018. While in Ubud, you have to bear in mind that you are living in nature. The forests and nature are here first, not whatever place you are staying at. So there will be random visitors that enter your place throughout the day, and that’s just part and parcel of living in nature! Geckos. 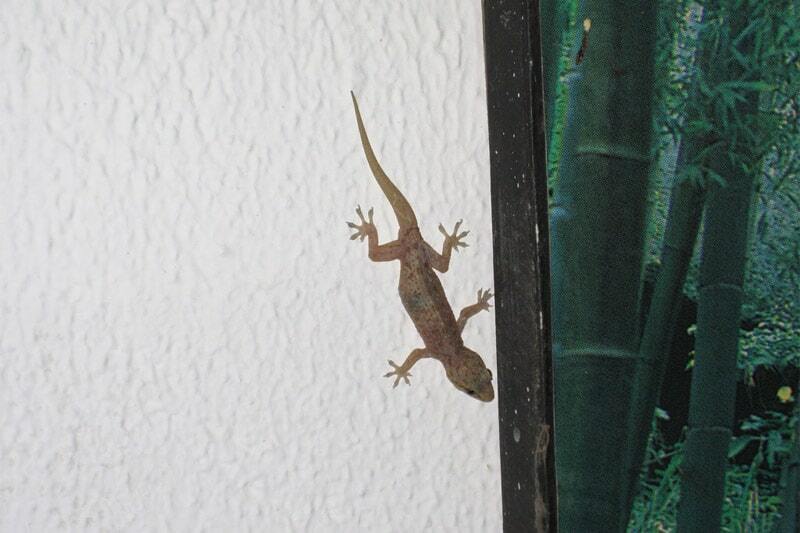 Geckos are ubiquitous in Bali/Ubud and you will see them no matter where you stay. In fact, geckos are very welcomed — the Balinese believe that geckos bring good luck to the home they are in! I was quite worried about the Ubud geckos before coming here as I wasn’t sure about their natural behavior, but this worry was unfounded as geckos here get out of your way as much as possible. I never had a gecko get on my bed or touch my clothes. I did find a gecko among my skincare products on my first day — he ran away right after I found it, but not before giving me a shock. <_< Geckos sometimes crawl on the floor so I had to watch out when walking. Gecko. This one is pretty large. The ones that came into my place were usually small or medium-sized. Mosquitos. Mosquitoes are aplenty in the countryside. You definitely need a mosquito repellant and anti-itch mosquito cream. I got several mosquito bites every day and nearly finished my anti-itch cream during my stay. Fleas. This is a nightmare. I don’t know how but I got a nasty flea attack in my second week! 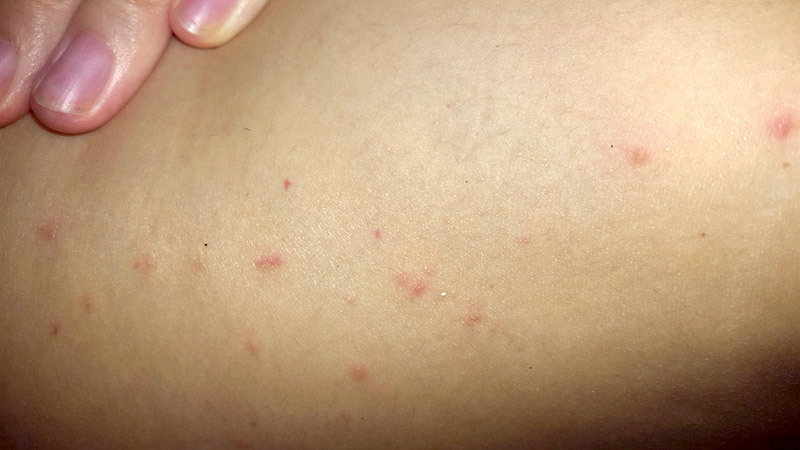 At first I thought I was just getting mosquito bites, but after I noticed that (a) I was getting six to eight new bites every day, (b) these bites were extremely itchy, (c) they were small red dots vs. big soft bumps typical of mosquito bites, and (d) they occurred behind my legs/thighs and were fairly near each other, I realized that I was being attacked by fleas! A partial shot of my flea bites, behind my thigh. This reflects only 1/5 of the bites I got. I had about 50 bites in total. Moths. Large and small of all colors. There are plenty of them in the countryside. I saw two to three every day. They come in all sizes and colors and rest everywhere. This is just a small one. This is a super large one. 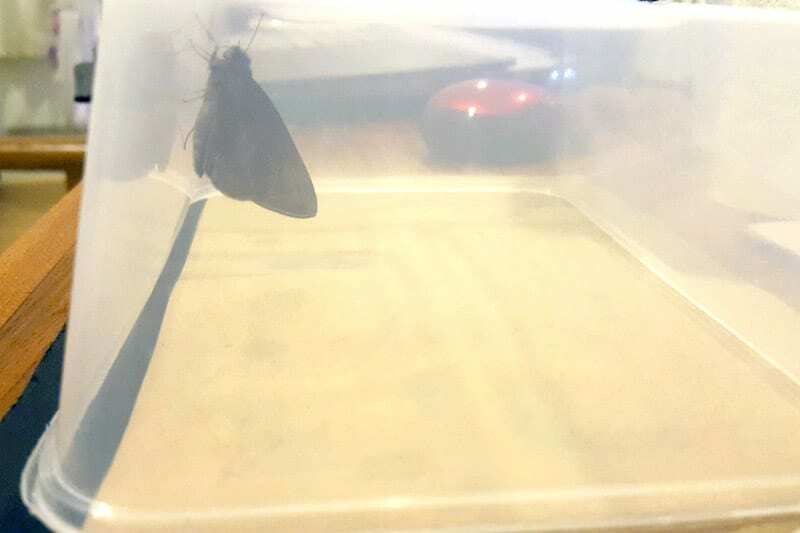 I caught it in a container and released it back outside. 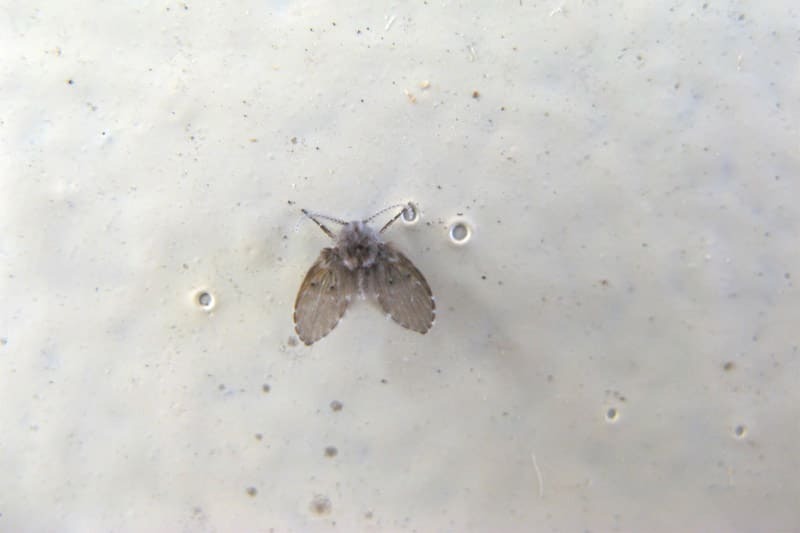 Drain fly with a 2-3X magnification. Centipede/Millipede. 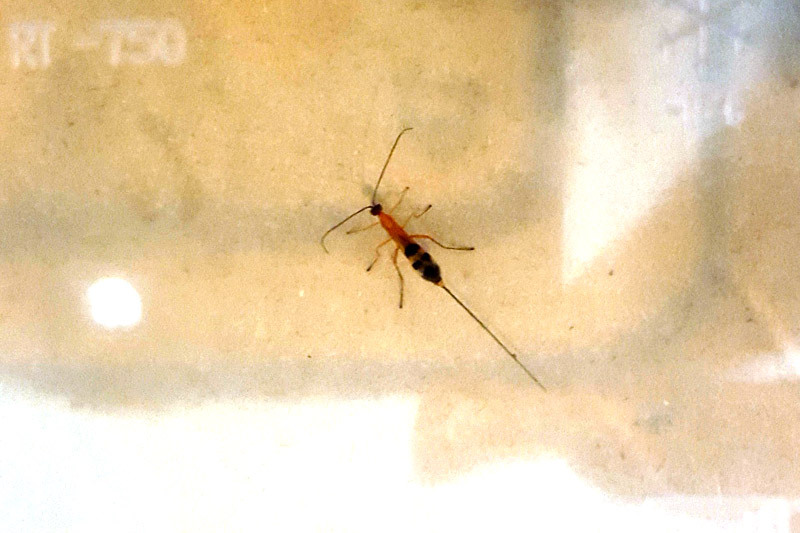 I picked a second-floor unit so I wouldn’t have to deal with worms and all that, and was surprised when I saw a centipede-like thing climbing up the curtain one day and on a separate occasion, a worm-like millipede (?) thing in my bathroom. These were the only two I found though. Beetles. One or two each night. They would just stick on the curtain. Some fly that’s attracted to light. On my third night, there was heavy rain. About an hour after the rain stopped, there was this medium-sized fly with long wings that started climbing through the gap between the balcony door and floor, and into my room. The problem was that soon, there were 50 of them inside my room, climbing up my curtain, with more coming in by the second. -_- I thought I was in some B-grade horror movie. I realized that these flies (a) appeared after the rain and (b) gravitate to a light source, so I quickly switched off the lights and stayed on my bed, inside the mosquito net. Subsequently, I did this every time it rained heavily at night and never had this problem again. Ants. You see ants in every tropical country but here they are persistent. You can’t leave food out for more than 30 seconds without risking it being found by ants. Put everything in the fridge, including bread. Other honorable mentions include a caterpillar in some cocoon thing (? ), a praying mantis, scorpion-looking bugs (they move very fast), bees, houseflies, random flies, a roach, a grasshopper, spiders, and random unknown bugs. Staying in Ubud Center was less eventful. During my one-month stay, I only saw a gecko in my room and two cockroaches. My unit was on the third floor so that might have helped, and to prevent cockroaches from coming in, I taped the gaps around my door and balcony doors. Ants were a constant nuisance though — I don’t think this changes no matter where you stay in Bali/Ubud. I had to get this white chalk ant-destroyer thing (sold in the local Coco Supermarket) because the place I stayed in Ubud Center was infested with ants — they were everywhere, constantly climbing the bed, my work chair (I’m talking like hundreds of them), the table, etc. Pick a lodging above the ground floor. I do believe that the higher the floor you stay, the less random bug visits you’ll get. Don’t get an outdoor shower. There are some places with outdoor bathrooms/showers — avoid them. I read of this guy who lived in a place with an outdoor toilet and he would see random insects in it sometimes. Once he saw a caterpillar with sharp spikes on the toilet seat! Imagine if he had just sat without looking! Get a place with airconditioning. 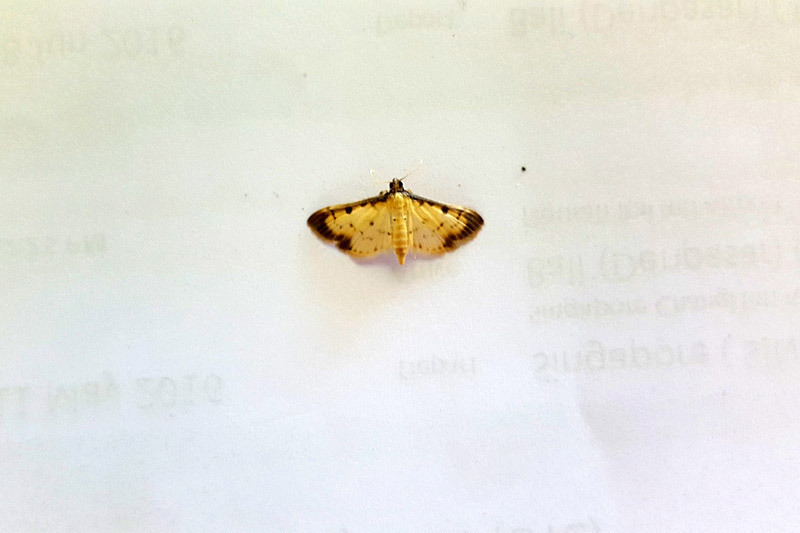 Because many bugs are attracted to light (they think it’s the sun), when night falls at 6-7 pm and you have your lights on, they start coming into your room. Despite having an air-conditioned room, I still had many bug visits because of the gaps around the balcony doors. This door design is common in Ubud. Bring a container. I’d rather not kill bugs unless they are hazardous, so bringing a container allowed me to capture and release them back outside. And the mandatory stuff: (1) anti-itch cream, (2) mosquito repellent and patch, and (3) blanket if your place doesn’t have one, to cover you while you’re sleeping. If you’re staying in the countryside, bring long track pants to protect your legs in case you get an insect attack. The official language in Bali is Indonesian while the locals speak Indonesian or Balinese. You shouldn’t have a problem in Ubud Center as it’s targeted at tourists and most people there know some basic English. The young people (those in their teens or early 20s) should know some English — I chatted with a few waiters in their early 20s who told me that they learned English in school. 80% of the Go-Jek drivers I met could speak basic/okay English. That said, don’t expect deep conversations in English. I found it difficult to converse with most locals so I kept communications to simple Q&A. I always spoke slowly so people could understand me. In restaurants, English literacy varies depending on where you go. At Sayuri, I found the staff has a very high command of English. At Alchemy though, the waiters in the dessert section could only communicate very basic things, like the price and item names (which were already labeled). They couldn’t answer (or didn’t understand) my questions like whether the raw cake would melt if I did a takeout. Similarly, when going to some veg restaurants, some assistants didn’t know much English besides the basics to handle an order. People living in the countryside, unless they are involved in tourist operations or they are very young (meaning they would have learned English in school), will probably not know English. The internet is unpredictable in Ubud. It’s normal to have your wifi cut off while working at a cafe (or to a lesser extent at home). Unless you’re working at a dedicated co-working space like Hubud or Outpost Asia, don’t expect a super stable connection (even at those co-working spaces, I’m sure there are times when their wifi gets cut off though they would have a full-time staff minimizing this). Many cafes have terrible wifi including international cafes like Atman. Their wifi gets cut off often or is so slow that you can’t get anything done. Or it would be fast at times and slow at other times. This would be the case even if there are just a few people. Speed-wise, it could range from 1mbps (or lower) to 3mbps per second. Some cafes have decent wifi, but this is subjected to the number of customers there. Kismet cafe says it has high-speed internet but they require you to spend a minimum of 50k rupiah per hour (on the menu) to use it. This wasn’t such a big issue for me as I kept my work to offline work, such as working on course powerpoint slides or reading Kindle. If I needed to use the internet but the cafe wifi was down, I would switch to my mobile hotspot. Over time though, I stopped working at cafes and would work in my room instead. It was hard to get high-level work done at cafes as there were constantly expats who would talk really loudly in the cafes. When picking your lodging, look for one with good wifi. The internet at my places was okay as I purposely looked for a place with good internet, save for occasional cut-offs (which as I mentioned is common in Bali). Speed-wise, a speed test showed 10 Mbps per second for download and 1-2 Mbps per second for upload. This is enough for most needs. I could watch YouTube HD videos with no lag and access and edit my site with no issues. I also had Skype calls with my assistant and clients with no major issues. Uploading audio files for my podcast would be slow due to the large file size. Because of that, I just stuck to writing and podcasting and didn’t do any video work. Using the internet on my prepaid sim card and Singapore postpaid card (I used roaming) was okay. I could use it to surf the internet, look up Google Maps, etc. with no issues. Occasionally it would be super slow or I would have no signal but I guess it depends on your provider (mine was XL). One problem in Ubud/Bali is power outages. There are two kinds, short outages and long outages. Short power outages aren’t a big issue and only last five minutes usually. This happened twice when I stayed in the countryside and once when I stayed in Ubud Center, and the power returned after five minutes. When I asked my countryside host about this, he said some stuff that I didn’t really understand, but the idea I got was that it’s normal and happens as part of “regulating” or “resetting” the power (?). I encountered two long power outages during my 2018 stay where the power went out in the whole of Ubud. Street lights, shop/home electricity, internet, room lights, air-conditioning, etc. The first time it was 6:30 pm and all the streets went dark. At that time I was out and it was raining heavily. I was already near home so it wasn’t an issue, but it can be tricky if you are caught unprepared. Since there was no power (so no aircon and no lights), my room was really stuffy and I had to open the doors at the risk of mosquitoes and insects coming in. I had a torchlight which came in handy and used my mobile hotspot for internet. Water supply was unaffected. The power came on at 8 pm after 1.5 hours. Unfortunately, this happened again the next day. The entire power went out at 6:30 pm and came back on at 7:30 pm. This time I was walking to a restaurant for dinner, so I ate there and waited until the power came back on before returning home. The restaurant staff had to put lit candles on the tables and any dish that required electricity (like the blender) could not be made. Talking to a local, he said that this isn’t common and happens maybe two to three times a year, and the power would come back on after a couple of hours. So I guess it was a fluke that it went out two days in a row while I was there. As a contingency, bring a torchlight and have a sim card with local internet access (be it data roaming or a local sim card). And maybe a spare battery pack for your phone. There is a bustling expat community in Ubud, though I didn’t interact with them. Besides being a tourist destination, many expats use Ubud as a base to set up and work on their business, usually a blog or some digital startup. With the low cost of living, healthy vegan food, beautiful nature, and good weather, it’s little wonder why! If you’re staying for a while and you’re looking to meet new folks, check out many Ubud meetups via Meetup.com. Hubud is a collaborative coworking space for entrepreneurs, techies, and creatives, and it comes with an accommodation option. If you need a super good internet connection, you can sign up for their coworking space to work, network, and meet like-minds. It’s expensive by local standards though. Outpost Asia is another coworking space here. You can work there, book accommodation, and attend events. They even offer wired LAN connections for their Skype calls — good for the important meetings where you want absolute stable connection. It’s cheaper than Hubud and looks like a good place, so it’s worth checking it out. I came to Ubud in 2016 and fell in love with the place. After returning in 2018 and living here for almost a month, I find that Ubud has lost some of its appeal to me, though it’s still a great place. Firstly, Ubud has become a very commercialized place. Prices are now higher for many (vegan) restaurants, maybe a 20-30% hike in 2-3 years. The taxi mafia and the way it tries to “price gouge” tourists runs counter to what I loved about Ubud originally. As long as you look like a foreigner, you’ll be bombed with solicitations for massage, taxi, etc. when you walk around in Ubud Center. When I was there, I felt like a money tree rather than a fellow human being. I also felt that there was little concept of “people helping people” if you’re a foreigner there — locals will find a reason to charge you money for every service/activity/action (be it a simple ride to town or otherwise), because you are a foreigner and you are seen to be filled with money if you are there. This is quite different from when I’m traveling in other countries. There’s a very clear delineation between locals and foreigners and it shows in how they communicate to you and their objective in talking to you (to price gouge). This doesn’t apply to every local of course, but it can be felt in many of my interactions with locals, especially those running services that target foreigners (accommodation, travel expeditions, etc.). With the large influx of foreigners to Ubud, I felt distanced from the true spirit of the place. Everywhere I went, I would see expats and tourists. The expats would be here to enjoy the good and cheap food, work on their startups, and enjoy the low cost of living, while the tourists would be there, well, to tour. There’s nothing wrong with any of this since I am a foreigner myself and I’m there to enjoy the nature too. But when every single person in the town area is a foreigner and many are in their own cliques, dominating the public spaces with their loud conversations and mannerisms from back home, and living in a way that’s no different from back in their home country, it begins to drive home the point that Ubud really isn’t Ubud anymore but more like foreigner central. In comparison, Chiang Mai didn’t feel like this when I was there in 2017. In the two months I was there, I noticed a good mix of foreigners and locals when visiting the main district, such as in areas like Maya Mall, the movie cineplex, the night markets, and the vegetarian restaurants. In Chiang Mai, you still feel like you’re in Chiang Mai with a mix of locals and foreigners rather than a place that’s washed over by foreigners. One thing I used to love about Ubud was its vegan food. Over the years though, I began to learn more about healthy living, including the toxic nature of vegetable oils. Despite the whole “heart healthy” branding surrounding vegetable oils, oil is not a natural food (this includes the supposedly healthy extra virgin olive oil). Many commercial oils are high in inflammatory omega-6 polyunsaturated fat. I also found issues about soy as I began to break out from eating it, and realized that it’s a common allergen and affects the hormones of our body. It’s possible that soy has always been bad for me, just that my body kept mitigating the damage until it started showing on my skin. Because of that, most of the food in Ubud became irrelevant to me. Soy (tofu, tempeh, soybeans, soy sauce, edamame, soy patty, miso, etc.) is everywhere in the vegan food in Ubud. Vegetable oil is used in almost all commercial food products and restaurants, including in Ubud. I still love raw food places like Sayuri and Alchemy (as long as the dish has no soy or oil), and I still enjoy cooked vegan food if it doesn’t have soy or vegetable oil. Unfortunately, restaurants and food establishments will keep using vegetable oil for as long as there’s no pushback from consumers because it’s cheap and dramatically prolongs the shelf life of food products (which helps in cost cutting). The fourth and perhaps the biggest reason is that I’m at a different stage of life now. Ubud, even Chiang Mai, is a great place for the single traveler or business owner, without ties in the world, seeking a remote lifestyle. Now that I’m in my mid-30s and married, I’m no longer interested in a transient type of living, i.e. hopping from one place to another and constantly watching out on the legal duration of stay. I did this throughout my late 20s (alone) to early 30s (with my husband), and I feel I’m ready to move on from it. What we are now looking for is a permanent home where we can be for at least a few years each time to build our lives as we enter our 40s and 50s. In conclusion, one of the things I love or loved about Ubud is that it was/is a non-commercial place filled with nature. But Ubud seems to have become very commercialized in recent years. It’s still an amazing place for veganism and nature, especially if you stay in the countryside and can ride a scooter. It’s an ideal spot for solo entrepreneurs and travelers who value purposeful living and are looking for a temporary place to find their life direction and/or build their next big thing. If you are a tourist, you should definitely visit Ubud for its beautiful nature, nice food, and cheap cost. My points above are more with regards to mid-to-long-term life considerations for myself. I hope you’ve found this guide useful. Be sure to bookmark it for your Ubud visit and pass it along to friends who are traveling to Bali! Ubud is still an amazing place and I hope it doesn’t degrade further into some crazy tourist trap like Seminyak/Kuta. Its beauty, nature, and focus on healthy eating are things lost in many places today. I hope that the values of materialism, commercialism, and profiteering don’t further contaminate it while the locals can continue with their good-natured way of life and spread their positive values to others.